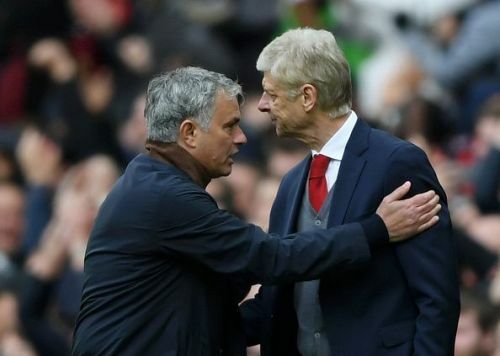 Jose Mourinho has hailed his former Premier League rival manager Arsene Wenger as 'one of a kind' and praised the Frenchman for winning the Premier League title without losing a single game. Wenger spent close to 22 years at the Arsenal Football club and helped the club to win three Premier League titles and seven FA Cups. Under Wenger, the North London club had won the Premier League title without losing a single game in EPL 2003-2004 season. It remains a record today which no team in the EPL has managed to achieve. Mourinho, who is regarded as one of the best managers, won remarkable three Premier League titles with Chelsea. Recently, Manchester United sacked the legendary manager after just two and a half seasons in charge. Prior to his sacking, he guided the Red Devils to Carabao Cup and Europa League titles in a short spell at Old Trafford. The two legendary figures in football locked horns in 19 games with the Portuguese winning for ten times and losing just twice. The easiest way to remember him is to say that he is one of a kind. In today's football, it's impossible for a coach to be 10, 15, 20 years in the same club, it's the last one. I really do not think we'll see a coach stays 10 years in a club, now the players go, the players come, the pressure is immense for the coach, you do a good season, but the next one is a bit worse. There is a huge pressure, a tendency to the rules of today say that coaches do not stay long, if we talk about football, Wenger is a trainer of the invincible, (Claudio) Ranieri, for example, is a coach that I call 'the miracle', title of champion of Leicester . Wenger is one of the Invincibles: he won the Premiership with Arsenal without losing a game and that lasts over time. Both Mourinho and Wenger are currently not managing any clubs. It remains to be seen which clubs the legendary managers will join in the near future.